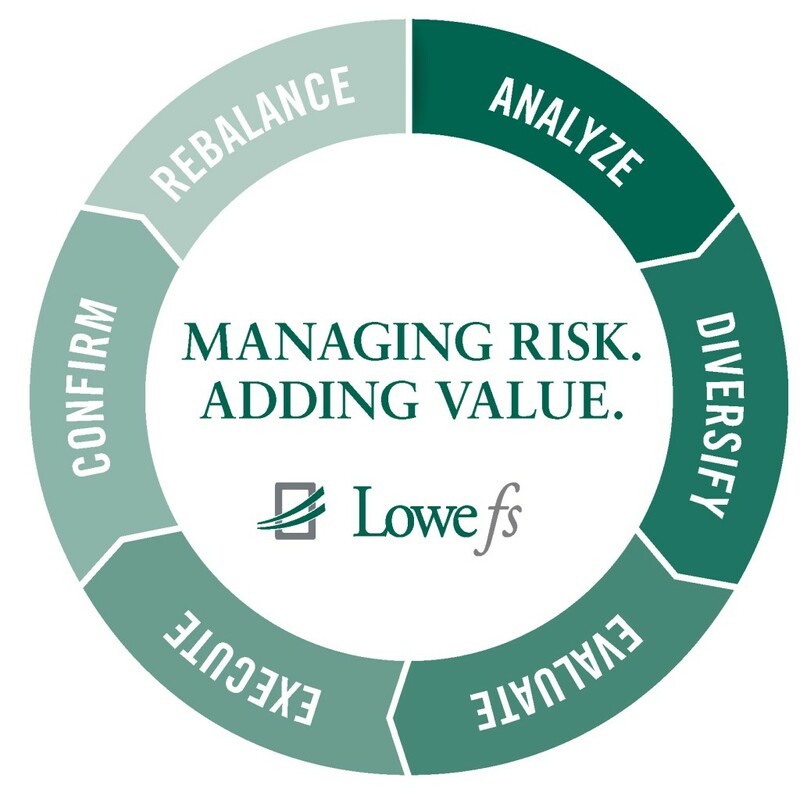 To help you achieve your financial vision, our focus at Lowe Wealth Advisors is equally on managing your financial risks and helping you achieve potential returns. * Our investment management philosophy is to identify financial risks, then attempt to mitigate them through responsible financial planning and portfolio investment management. By serving as our clients’ financial watchmen, we do our best to alleviate your financial anxiety by simplifying complex concepts and keeping you informed always. Clients can learn how we help manage their wealth thanks to our six-step investment process. Analyze. Through thorough research, we evaluate the market and economy. We also create a “Risk Budget” for your portfolio, addressing all the financial risks you face. Diversify. We merge our research with your personal Risk Budget to develop your target asset allocation. Core positions are your portfolio’s foundation. They are typically held longer than tactical positions, but both tactics work in tandem to identify potential opportunities or potential risks. Evaluate. Combining your core and tactical positions with our extensive research, we determine what we believe to be the ideal manager for each target investment category within your given asset allocation. Execute. Before allocating your portfolio, we consider any restrictions, tax issues, or other complications you wish to avoid. Confirm. We have an active management style, but that does not equate to market timing or chasing returns. Our approach to active management attempts to limit the downside in portfolios. We implement a weekly, monthly, and quarterly process to confirm, evaluate, and adjust our strategies as appropriate. Rebalance. We review your portfolio and determine any new or changing Risk Budget factors. Your core positions are rebalanced, and the process begins again. *It is impossible to completely eliminate risk in any portfolio. Asset allocation can help to minimize certain types of risk; however, you may still be subject to market risk, industry risk, sector risk, and interest rate risks. Our goal is to help you manage risk in the manner that best matches your goals. Please Note: The scope of any financial planning and consulting services to be provided depends upon the terms of the engagement, and the specific requests and needs of the client. Lowe does not serve as an attorney, accountant, or insurance agent. Lowe does not prepare legal documents or tax returns, nor does it sell insurance products. As disclosed on its written disclosure Brochure, if a client desires, a Lowe representative and/or affiliate, in his/its separate individual licensed capacities, can be engaged to be provide insurance sales/services and/or tax preparation and accounting services, per the terms and conditions of a separate engagement and compensation.